The short period of Balkan history during World War II when the Axis Powers, Italy and Germany, invaded Yugoslavia triggered a cycle of violence that equaled that of the 1990s. 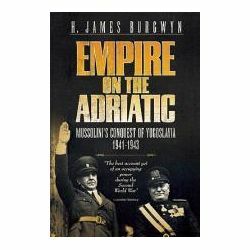 The focus of this book is the Italian occupation of Yugoslavia between 1941 and 1943 and the role that Fascist Italy played in this tragic time. Encountering tough partisan resistance and determined German rivalry, Italian imperialism frequently sputtered and eventually burned out, leaving behind many enemies and few heroes to honor at home. But the Italian 2nd Army salvaged some degree of honor by providing refuge for thousands of Orthodox Serbs and Jews, thus saving them from the German and Croatian death camps. Produkt został dodany 08.08.2013 10:33. Ostatnia zmiana danych produktu miała miejsce 13.02.2014 11:32.